Order by 2PM for same-day installation! ADT monitoring prices range from $36.99/month* (about $9.00 per week*) to $52.99/month* (about $14.00 per week*). 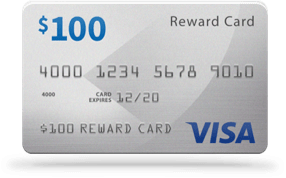 Installation costs start at $99 and all packages come with a $100 Visa® Reward Card**, plus a standard monitoring system valued at $850. CellGuard® lets you connect your monitoring system to ADT monitoring centers without the use of a landline. ADT Pulse® connects your security monitoring to your home automation. Monitor and manage your system and smart devices from virtually anywhere with the ADT Pulse® app. What do you get with ADT monitoring? When it comes to home security, ADT monitoring doesn’t sacrifice quality. No matter what package you choose, rest assured that your monitored home security system will be professionally installed by a qualified technician. The best part? If you’re looking for more convenient monitoring features, you have the option to upgrade your package at any time. If you order today, you’ll get access to the following benefits. ADT will cover up to $500† of your insurance deductible if a burglary occurs while your monitored home security system is armed. ADT monitoring customers may qualify for special mover discounts. Ask if you’re eligible today! All ADT Monitored security packages include 24/7 professional monitoring so you can feel safe and secure at your home or away. Choose the Essentials package, Total Protection package or Premium Protection package and get a $100 Visa Reward Card**. Call today to find the right ADT monitoring package for your home. How much do ADT monitored security packages cost? 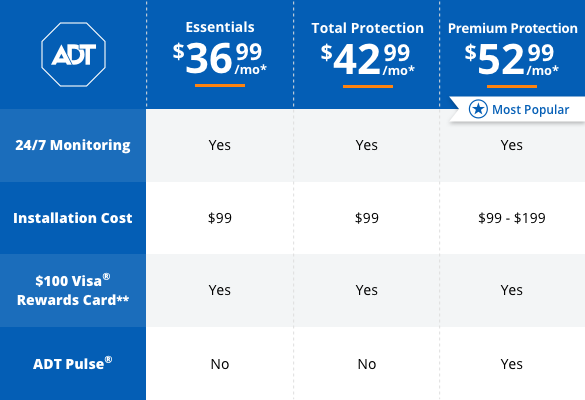 ADT Essentials package starts at $36.99/month* (around $9.00 per week*), Total Protection starts at $42.99/month*, Premium Protection starts at $52.99/month*. All packages include a FREE monitoring system valued at $850 and offer installation starting at $99.